Recently just moved over from it’s home, and the home of eel rice – Japan. This restaurant is doing awesome business right off the bat. However, does it live up to the hype and the 1hr+ line out the door? Choose from steamed then BBQ’d eel, or just straight up steamed eel. The rest of the dishes are optional. But, really, if you’re coming here then you should be coming for the eel, as that’s what this place is known for. As we had lined up and were only the 4th table to be seated, we were welcomed by an immaculately clean dining area. That screen at the back is secluding off a private room which you can book, too, if you have guests in town. If this was for anything other than this site, I wouldn’t be ordering the steamed eel, as really, I am a big fan of BBQ eel. However, for you guys, we did. The eel itself is completely fine, but doesn’t make me jump up and down or scream with delight. Really, the flavour is a little bland, if anything. The strings of egg are somewhat lackluster and don’t hold much flavour. The rice is very good and the flavour of the sauce seeping into it really gives it great depth. I could quite happily eat the rice all the time. This soup accompanies all of the main dishes. It’s an eel liver soup. Sound like something you are interested in? I was, however, when I tasted it I changed my mind – the flavour of the soup itself was ok, but the eel liver had a really strong fish flavour and was quite chewy. I didn’t care for that, much, at all. 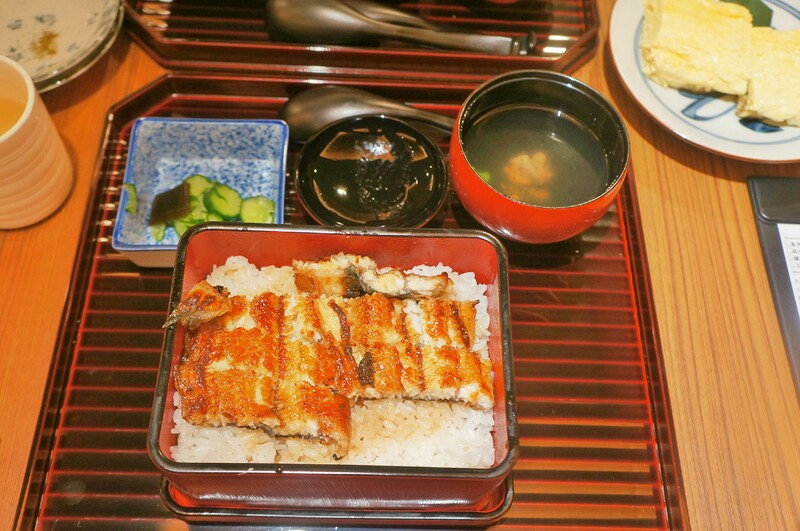 The signature dish – BBQ eel! The outside was slightly crunchy and crispy around the edges. The inside was delicately soft and the eel was ‘meaty’. As said above, when the sauce soaks into the rice it is delicious. But, to be fair, the rice by itself is good enough to hold its own. Worth ordering, but, I would still say that 肥前屋 is better on flavour and quality. We like these so much, that we bought a specific pan so we could practice making them at home – my wife is more than happy being the chief taste tester! Usually I look for a slight sweetness in these and a dense egg. However, this one was salty and slightly runny. I have to say, the consistency wasn’t the issue, but the salty eel inside perhaps was. It didn’t go down well. Not for the faint-hearted, right? This was something I just had to order because I’d never seen it on a menu before. However, it’s something I probably wouldn’t order again. Either it was cooked for too long (very, very crispy to the point of being burnt), or it is intentionally cooked until it charcoals. Either way, there wasn’t a huge lot of flavour, but there were textures galore: slimy, crunchy and chewy being the main ones.